Sweden-based Holmen, which also produces sawn timber and runs forestry and energy production operations, said the substantial improvement is the result of a long-term investment and means that the company has taken a further step towards reducing the climate impact of its operations. 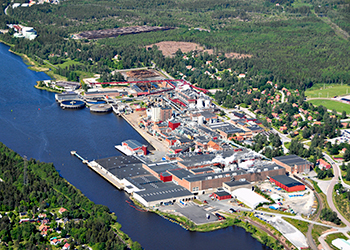 Major investments have been made at Hallsta Paper Mill (Sweden) to increase its energy efficiency, mainly through increased heat recovery from paper machines and pulp production. During 2014, emissions of fossil carbon dioxide decreased by around 70 per cent compared with 2013. At Braviken Paper Mill (Sweden), oil consumption has decreased due to improvements in the operational strategy for the mill’s steam system, greater efficiency in the solid fuel boiler and increased steam recovery from the production of thermo-mechanical pulp. Together these measures have allowed Holmen to reduce emissions of fossil carbon dioxide by 45 per cent in 2014, from 123 to 67 kilos per tonne of paper and paperboard products produced, compared with 2013. In recent years Holmen has received several awards for its sustainability work and is included in the UN’s global stock index Global Compact 100 for companies that show a strong financial performance combined with sustainable operations. During 2014 Holmen also gained a place in the Carbon Disclosure Projects (CDP) list of 187 listed companies that are pioneers in the fight against the threat of climate change. In January 2015 Holmen was also named by CDP as one of the 121 best suppliers in the world as regards action against climate change. The group has five production plants in Sweden and one each in the UK and Spain. The forests and hydro power facilities are located in Sweden.